The Alva Utility Authority (Authority) received approval for $2,635,000 in funding Tuesday from the Oklahoma Water Resources Board (OWRB) to improve the Authority's water infrastructure. Construction of upgrades and improvements to the water system will be financed by the Oklahoma Drinking Water State Revolving Fund (DWSRF). The Authority will use the proceeds to construct a 1.5 million gallon pre-stressed concrete water storage tank and booster station in order to replace two aging 500,000 gallon storage tanks. The project will protect water quality by replacing two existing old and deteriorating storage tanks and by ensuring adequate pressure is provided throughout the distribution system. These improvements also will protect the distribution system from contamination. Joe Freeman, Chief of the OWRB's Financial Assistance Division, calculated that the Authority's customers will save an estimated $224,000 over the life of the thirty-year loan compared to traditional financing. The DWSRF loan will be secured with a lien on the revenues of the Authority's water, sewer, and sanitation systems. Attending the OWRB's monthly meeting in support of the loan application was City Business Manager Joe Don Dunham. The DWSRF program is administered by the OWRB and the Oklahoma Department of Environmental Quality (ODEQ) with partial funding from the U.S. Environmental Protection Agency (EPA). The DWSRF program has provided approximately $1.1 billion in drinking water loans to provide communities the resources necessary to maintain and improve the infrastructure that protects our valuable water resources statewide. Since 1983, the Oklahoma Water Resources Board has approved over $3.7 billion in loans and grants for water and wastewater infrastructure improvements throughout Oklahoma. Julie Cunningham, Executive Director of the OWRB, and Scott Thompson, Executive Director of the ODEQ, express their sincere appreciation to State Representative Carl Newton for his support of the DWSRF program. The Broken Arrow Municipal Authority (Authority) received approval for a $2,100,000 loan Tuesday from the Oklahoma Water Resources Board (OWRB) to improve the Authority's metering infrastructure. Construction of upgrades and improvements to the system will be financed by the Oklahoma Clean Water State Revolving Fund (CWSRF). The Authority will utilize the proceeds to acquire and install approximately 9,000 automated meter reading (AMR) water meters, as well as meter boxes, meter box lids, shut-off valves, and hand held meter reading devices. This project focuses on water conservation and efficiency by reducing water loss in Broken Arrow's system. The new meters will provide leak detection alerts, thereby reducing unintended flows to the wastewater system. Additionally, the installation of the meters could lead to increased water supply reliability through providing the system officials with a better understanding of potential vulnerabilities. Finally, the project will help meet Oklahoma's Water for 2060 goals. The CWSRF loan will be secured with a lien on the revenues of the Authority's water, sewer, and sanitation systems, as well as a one-cent sales tax. Attending the OWRB's monthly meeting in support of the loan application was Assistant City Manager Kenny Schwab. “We are grateful to Broken Arrow's legislative delegation for their support of our financial assistance programs,” said Julie Cunningham, Executive Director of the OWRB. The Authority will utilize the proceeds to rehabilitate and expand a water treatment plant to two million gallons per day capacity. The rehabilitation and expansion will consist of one aerator, two in-line static mixers, one lime storage and feeder system, two 36-foot diameter solids contact units, one recarbonation basin, one gas clorination system and building, the conversion of two existing solids contact units to four filters, the rehabilitation of two existing filters, and the construction of two lagoons. The project will bring a more sustainable water source for the Authority, and reduce its reliance on purchasing water. Joe Freeman, Chief of the OWRB's Financial Assistance Division, calculated that the Authority's customers will save an estimated $837,000 over the life of the twenty-year loan compared to traditional financing. The DWSRF loan will be secured with a lien on the revenues of the Authority's water system and a half-cent sales tax. Attending the OWRB's monthly meeting in support of the loan application was Bond Counsel David Floyd. Julie Cunningham, Executive Director of the OWRB, and Scott Thompson, Executive Director of the ODEQ, express their sincere appreciation to State Senator Paul Scott and Representative Bobby Cleveland for their support of the DWSRF program. The Oklahoma City Water Utilities Trust (Trust) received approval Tuesday from the Oklahoma Water Resources Board (OWRB) for $68,800,000 in funding through the Oklahoma Clean Water State Revolving Fund (CWSRF) to conduct several water infrastructure improvements and studies as well as to refinance a previous water infrastructure loan. The Trust will utilize the funds for a construction project to increase the capacity of the Atoka Dam spillway and to replace the existing chute. The spillway project will also replace additional deteriorated infrastructure while helping the receiving stream, North Boggy Creek, with sediment and erosion. The funds will also be used for additional projects and studies, including: to rehabilitate of the Chisholm Creek Wastewater Treatment Plant (WWTP) to reduce maintenance requirements, to conduct two engineering studies related to future wastewater treatment infrastructure needs in northern and western Oklahoma City, to replace 58,000 linear feet of sewer lines that has a history of failures, overflows, or high maintenance costs, and to conduct other sewer line repairs as needed. Joe Freeman, Chief of the OWRB's Financial Assistance Division, calculated that the Trust's customers will save an estimated $6,267,000.00 over the life of the thirty year CWSRF financing compared to traditional financing. The CWSRF financing will be secured with a lien on the revenues of the Trust's water and sewer systems. Attending the OWRB's monthly meeting in support of the loan application were Financial Operations Manager Billy Little, Civil Engineer Nathan Madenwald, and Engineering Manager Sam Samendi. “We are grateful to Oklahoma City's legislative delegation for their support of our financial assistance programs,” said Julie Cunningham, Executive Director of the OWRB. The Wilburton Public Works Authority (Authority) received approval for a $204,760 loan Tuesday from the Oklahoma Water Resources Board (OWRB) to improve the Authority's wastewater infrastructure. Construction of upgrades and improvements to the wastewater system will be financed by the Oklahoma Clean Water State Revolving Fund (CWSRF) along with $195,240 in local funds. The Authority will utilize the proceeds to make lift station improvements, replace approximately 3,450 linear feet of PVC sewer line, replace thirteen manholes, repair approximately 200 linear feet of surface, and rehabilitate the Northwest Lift Station by replacing the pumps. This project will reduce operating costs, reduce the effluent sent to the wastewater treatment plant, and improve the Authority's inflow and infiltration issues from heavy rain events which can also cause system failure. Joe Freeman, Chief of the OWRB's Financial Assistance Division, calculated that the Authority's customers will save an estimated $230,000.00 if compared to traditional financing. The CWSRF loan will be 100% loan forgiveness. Attending the OWRB's monthly meeting in support of the loan application was Engineer Crysta Watson. “We are grateful to State Senator Larry Boggs and Representative Brian Renegar for their support of our financial assistance programs,” said Julie Cunningham, Executive Director of the OWRB. On Oct. 31 – Nov. 1, around 500 attendees gathered in Norman, Ok for the 38th annual Oklahoma Governor's Water Conference and Research Symposium to closely examine our state's “Liquid Assets: The Value of Water Investment in Oklahoma.” In addition to marking the 60th Anniversary of the OWRB, this conference also included an expanded awards program featuring the presentation of both the prestigious Oklahoma Water Pioneer Awards and the inaugural Oklahoma Water for 2060 Excellence Awards. The Water for 2060 Excellence Awards were created to recognize individuals or entities that have developed outstanding water saving measures in three separate categories— Public Water Supply, Energy/Industry, and Crop Irrigation/Agriculture Production. The awards were established in support of Oklahoma's Water for 2060 Act and the recommendations of a special advisory council to Governor Mary Fallin and the Legislature. The winners of the first-ever Water for 2060 Excellence Awards were the City of Edmond, City of Oklahoma City, Continental Resources, Newfield Exploration Company, OG&E, Koch Fertilizer, Jimmy Emmons, and the Long Family Farms Partnership. "If Oklahoma is to achieve the goal established under the Water for 2060 Act, to use no more fresh water in 2060 than we were using in 2010 while preserving our population growth and economic development goals, it will take public and private innovation and leadership in water conservation, reuse, and reclamation projects of the type demonstrated by our Water for 2060 Excellence Award winners," said OWRB Executive Director Julie Cunningham. "On behalf of the Governor and the Water for 2060 Advisory Council, I congratulate each of you and your organizations on this well-deserved honor." The Oklahoma Water Pioneer Award was initiated in 1985 to honor the men and women who have made significant contributions in the planning, development, management, and conservation of Oklahoma's water resources. This year's Oklahoma Water Pioneers were Glen Cheatham, Jim Townsend, and Pete White. “The citizens of Oklahoma owe much to these Water Pioneers for their dedication and leadership. This award is a gesture of appreciation for their wisdom in helping manage Oklahoma's water resources, and for doing their part to preserve the integrity, beauty, and usefulness of the state's waters for future generations,” added Cunningham. In addition to the awards, a robust conference agenda featured keynote addresses from Oklahoma Governor Mary Fallin, Seth Siegel, entrepreneur, water activist and a bestselling author of Let There Be Water: Israel's Solution for a Water-Starved World, and Layne Carter of NASA's Marshall Space Flight Center and the Water Subsystem Manager for NASA's International Space Station, and Oklahoma's esteemed historian, Dr. Bob Blackburn, to name just a few. The conference and symposium, hosted by the OWRB and the Oklahoma Water Resources Center, is the state's premier water-related issues event. The event annually features both internationally and nationally renowned water issues experts while covering a broad spectrum of water-related issues facing the state of Oklahoma. Wilburton Public Works Authority (Authority) received approval for a $2,170,000.00 Financial Assistance Program (FAP) loan Wednesday from the Oklahoma Water Resources Board (OWRB) to improve their water and wastewater infrastructure. The FAP proceeds will be used to refund the Authority's 2008 Utility System Revenue Bonds, which were issued to construct a water treatment plant. The FAP proceeds will also be used to close one lagoon, replace a blower, repair the wastewater treatment plant's grit removal system, remove and replace sewer lines and thirteen manholes, and perform surface repair. According to Joe Freeman, chief of the OWRB's Financial Assistance Division, the Authority's customers will save an estimated $176,000 over the life of the twenty-six year loan compared to the previous financing. The loan shall be secured with a lien on the revenues of the Authority's water, sewer, and sanitation systems, as well as a one and a half cent sales tax. Officials of the Authority attending the OWRB's monthly meeting in support of the loan application included City Attorney Wes Brown and Engineer Dale Burke. “We are grateful to State Senator Larry Boggs and State Representative Brian Renegar for their support of our financial assistance programs,” said Julie Cunningham, Executive Director of the OWRB. Grand Lake Public Works Authority (Authority) received approval for a $1,425,000 Financial Assistance Program (FAP) loan Wednesday from the Oklahoma Water Resources Board (OWRB) to refinance debt previously issued to improve their water and wastewater infrastructure. The Authority will use the proceeds to refinance a loan already held by the OWRB, and to establish a debt service reserve. The original loan refinanced four previous loans and provided funds to lease land for water well sites. According to Joe Freeman, chief of the OWRB's Financial Assistance Division, the Authority's customers will save an estimated $105,000 over the life of the fourteen year loan compared to the previous financing. The loan shall be secured with a lien on the revenues of the Authority's water and sewer systems. “We are grateful to State Senator Michael Bergstrom and State Representative Josh West for their support of our financial assistance programs,” said Julie Cunningham, Executive Director of the OWRB. The Porum Public Works Authority (Authority) received approval for a $496,117 loan Wednesday from the Oklahoma Water Resources Board (OWRB) to improve the Authority's wastewater infrastructure. Construction of upgrades and improvements to the wastewater system will be financed by the Oklahoma Clean Water State Revolving Fund (CWSRF). The Authority will use the CWSRF proceeds to correct for inflow and infiltration (I&I). Currently the system is comprised of mostly clay piping with brick and concrete manholes and is in poor condition. By removing and replacing the clay sewer line with PVC, replacing 20 manholes, and conducting surface repairs, the Authority will remedy their I&I issues and reduce operational costs and unintended flows to the wastewater treatment facility. Joe Freeman, Chief of the OWRB's Financial Assistance Division, calculated that the Authority's customers will save an estimated $392,000 over the life of the fifteen year loan compared to traditional financing. The CWSRF loan will be secured with a lien on the revenues of the Authority's water and sewer systems. Officials of the Authority attending the OWRB's monthly meeting in support of the loan application included Superintendent Jimmy Robinson and Office Manager Sissy Swafford. “We are grateful to State Senator Roger Thompson and State Representative Ed Cannaday for their support of our financial assistance programs,” said Julie Cunningham, Executive Director of the OWRB. The Coalgate Public Works Authority (Authority) received approval for a $213,050 loan Wednesday from the Oklahoma Water Resources Board (OWRB) to improve the Authority's wastewater infrastructure. The design of upgrades and improvements to the wastewater system will be financed by the Oklahoma Clean Water State Revolving Fund (CWSRF). The Authority will use the proceeds for planning and design and a Sanitary Sewer Evaluation Study (SSES). Planning and design will include the design of collection lines and lift station improvements to help with inflow and infiltration (I&I) of the system. Currently the system consists of clay, ductile iron and PVC pipes that are in need of repair or replacement. Video inspections and smoke testing of the existing 71,000 linear feet of sewer lines will allow the Authority to reduce operation and maintenance costs, improve system capacity, and reduce unintended flows to the wastewater treatment plant. Joe Freeman, Chief of the OWRB's Financial Assistance Division, calculated that the Authority's customers will save an estimated $237,000 over the life of the ten year principal forgiveness loan compared to traditional financing. The CWSRF loan will be secured with a lien on the revenues of the Authority's water, sewer, and sanitation systems, as well as a one cent sales tax. Attending the OWRB's monthly meeting in support of the loan application was City Manager Roger Cosper. “We are grateful to State Senator Josh Brecheen and State Representative Donnie Condit for their support of our financial assistance programs,” said Julie Cunningham, Executive Director of the OWRB. The Weleetka Public Works Authority (Authority) received approval for a $82,500 loan Wednesday from the Oklahoma Water Resources Board (OWRB) to improve the Authority's wastewater infrastructure. The design of upgrades and improvements to the wastewater system will be financed by the Oklahoma Clean Water State Revolving Fund (CWSRF). The Authority will use the funds for a Sanitary Sewer Evaluation Study (SSES) and the design of collection lines and lift station improvements. The collection system has been identified as a major source of inflow and infiltration (I&I), which increases the volume of wastewater reaching the treatment facility and being discharged into Alabama Creek, a tributary of the North Canadian River. Joe Freeman, Chief of the OWRB's Financial Assistance Division, calculated that the Authority's customers will save an estimated $100,000 over the life of the ten year forgiveness loan compared to traditional financing. The CWSRF loan will be secured with a lien on the revenues of the Authority's sewer system. Officials of the Authority attending the OWRB's monthly meeting in support of the loan application included Chairman Kevin Brill and Secretary Kathryn Starkey. “We are grateful to State Senator Larry Boggs and State Representative Steve Kouplen for their support of our financial assistance programs,” said Julie Cunningham, Executive Director of the OWRB. Waurika Lake Master Conservancy District (District) received approval for a $24,960,000 Financial Assistance Program (FAP) loan Wednesday from the Oklahoma Water Resources Board (OWRB) to refinance debt issued previously to improve their water infrastructure. The District will use this loan's proceeds to refinance a loan already held by the OWRB, and to establish a debt service reserve. The original loan was used to purchase water storage rights and make improvements to the water system of the District. According to Joe Freeman, chief of the OWRB's Financial Assistance Division, the District's customers will save an estimated $680,000 over the life of the eighteen year loan compared to the previous financing. The loan shall be secured with a lien on the revenues of the District's water storage and transmission facilities, including the municipal agreements with the cities of Lawton, Duncan, Walters, Comanche, Temple, and Waurika. Attending the OWRB's monthly meeting in support of the loan application was Rick Smith, Financial Advisor for the District. “We are grateful to State Senators Chris Kidd, Randy Bass, and Paul Scott, and State Representatives Marcus McEntire, Scott Biggs, John Montgomery, Jeff Coody, Rande Worthen, and Scooter Park for their support of our financial assistance programs,” said Julie Cunningham, Executive Director of the OWRB. The Altus Municipal Authority (Authority) received approval for an $11,000,000 loan Wednesday from the Oklahoma Water Resources Board (OWRB) to improve the Authority's wastewater and metering infrastructure. Construction of upgrades and improvements to the infrastructure will be financed by the Oklahoma Clean Water State Revolving Fund (CWSRF). The Authority will use the CWSRF proceeds to repair and upgrade the Southeast Wastewater Treatment Plant (WWTP), and install new Automated Meter Infrastructure (AMI). Specifically, the Authority plans to install a new mechanical bar screen, replace existing pumps, modify the existing aeration basin influent distribution box, replace equipment in the existing clarifier and construct a new clarifier, a new auxiliary return activated sludge pump station, new ultraviolet effluent disinfection system, replace bypass pond pumps, replace existing plant control system, miscellaneous structures, piping, and electrical work, and other minor plant work. These improvements will improve the discharge and effluent into an unnamed tributary to Stinking Creek. The AMI project will replace approximately 8,000 existing water meters and 12,000 existing electric meters. The new meters will allow for the Authority and its customers to better monitor and control and bill for the water and electricity used by its citizens, ultimately reducing the amount of water and electricity consumed and therefore reducing wastewater generation and air-pollutants deposition. Joe Freeman, Chief of the OWRB's Financial Assistance Division, calculated that the Authority's customers will save an estimated $1,635,000 over the life of the twenty year loan compared to traditional financing. The CWSRF loan will be secured with a lien on the revenues of the Authority's water and sewer systems. Attending the OWRB's monthly meeting in support of the loan application was City Manager Janice Cain. “We are grateful to State Senator Mike Schulz and Representative Charles Ortega for their support of our financial assistance programs,” said Julie Cunningham, Executive Director of the OWRB. The 38th annual Oklahoma Governor's Water Conference and Research Symposium will be held on October 31 and November 1 at the Embassy Suites Conference Center in Norman, Ok. The conference and symposium annually attracts hundreds of water officials and citizens who share an avid interest in Oklahoma's water resources management, development, and protection. This year's theme, “Liquid Assets: The Value of Water Investment in Oklahoma,” will give attendees the opportunity to explore both the historic importance that Oklahoma's water resources have played in our state's prosperity and the critical importance of continued innovative approaches to future management of those resources to ensure prosperity for future generations. Conference keynote speakers include Oklahoma Governor Mary Fallin, Seth Siegel, serial entrepreneur, water activist and a bestselling author of Let There Be Water: Israel's Solution for a Water-Starved World and Layne Carter of NASA's Marshall Space Flight Center and the Water Subsystem Manager for NASA's International Space Station. The symposium portion of the event, hosted by the Oklahoma Water Resources Center, will feature poster and oral presentations by students and professionals on a wide variety of water-related topics, as well as additional speakers and panel discussions. This year's event will also highlight the Oklahoma Water Resources Board's (OWRB) 60th Anniversary as Oklahoma's water agency. Oklahoma's esteemed historian, Dr. Bob Blackburn, will highlight the last 60 years of Oklahoma's water resource management. Finally, the conference awards program has also been expanded this year to feature both the annual presentation of the prestigious Oklahoma Water Pioneer Awards and the newly created Oklahoma Water for 2060 Excellence Awards. In support of the Oklahoma Water for 2060 Act and the recommendations by a special advisory council to the Governor and Legislature, the OWRB has created the Oklahoma Water for 2060 Excellence Awards to recognize individuals and entities that have developed outstanding water saving measures in three categories— Public Water Supply, Energy/Industry, and Crop Irrigation/Agriculture Production. Recipients of both the Water Pioneer and Water for 2060 Excellence awards will be recognized during special ceremonies during the conference. The Oklahoma Water Resources Board's (OWRB) has launched an interactive map viewer highlighting the details of the agency's fish monitoring from 2003 to 2016 at nearly 400 stream monitoring sites statewide. Each point on the map displays site location information as well as details on the species and number of fish found on-site during that specific collection activity. Biological specimens are collected as part of the OWRB's Beneficial Use Monitoring Program (BUMP), and the OWRB's Statewide Surface Water Statistical Survey monitoring program. More than 150 species are represented on the map viewer across the various collection sites displayed. "The OWRB's water monitoring activities provide a very detailed and comprehensive statewide analysis of fish species populations among several other parameters that we are monitoring. This particular map viewer contains layers that display all fish species collected for more research-minded users. It also provides layers that display sports fish numbers and types for use by anglers," said Bill Cauthron, Chief of the OWRB's Water Quality Division. The goal of the OWRB's monitoring programs, such as fish monitoring and data collection, is to provide statistically sound, unbiased information on the health of streams and rivers across Oklahoma. For statistical survey monitoring, randomly selected rivers and streams across the entire state are sampled. These sites are selected by a computer program, where each stream site has an equal probability or chance of being targeted for monitoring. At each site, a broad suite of parameters is collected to assess the condition of the stream. These parameters include: water chemistry, algae collection, macroinvertebrate collection, fish collection, and physical habitat assessment. Species are collected between May and October from each stream reach using seines or electrofishing equipment depending on water conditions. Most fish are identified on site and then released. At selected sites, some fish may be kept for tissue analysis. "The amount of data collected by our monitoring teams at lake, stream, and groundwater sites is massive," added Cauthron. "These monitoring activities are also crucial to water resource planning throughout Oklahoma. This map viewer is just one great example of how the OWRB is working to make our water data readily available and usable for Oklahoma's citizens, and to provide quality informational and planning tools for each of Oklahoma's water use sectors. I'd also like to thank our GIS team for creating a great final product for the public to use this wealth of data." For more information regarding the OWRB's water quality monitoring program, visit: www.owrb.ok.gov/monitoring. For more of the OWRB's various interactive maps and GIS data, visit: www.owrb.ok.gov/maps. The Bixby Public Works Authority (Authority) received approval for a $24,000,000 loan Tuesday from the Oklahoma Water Resources Board (OWRB) to improve the Authority's wastewater infrastructure. Construction of upgrades and improvements to the wastewater system will be financed by the Oklahoma Clean Water State Revolving Fund (CWSRF) along with $4,308,927 in local funds. The project will help improve water conservation and efficiency by reducing water loss in the Authority's system, as well as help meet the statewide Water for 2060 goals. The Authority will use the funds to install a new automated meter reading (AMR) system and construct a new sequence batch reactor (SBR) wastewater treatment plant (WWTP). The AMR system will replace approximately 9,000 older meters which contribute to unaccounted water loss. AMRs provide leak detection alerts, thereby reducing unintended flows to the wastewater system. Additionally, installation of AMRs could lead to increased water supply reliability because the Authority has a better understanding of any potential system vulnerabilities. The new SBR WWTP will have a single discharge point and will provide on-site stormwater equalization to prevent bypasses at the South WWTP. This will decrease the amount of sediment to the Arkansas River. Joe Freeman, Chief of the OWRB's Financial Assistance Division, calculated that the Authority's customers will save an estimated $2,346,000 over the life of the 30-year loan compared to traditional financing. The CWSRF loan will be secured with a lien on the revenues of the Authority's water and sewer systems, as well as a one cent sales tax. The Authority's officials attending the OWRB's monthly meeting in support of the loan application included City Manager Jared Cottle and Financial Advisor Jon Wolff. “We are grateful to State Senator Joe Newhouse and State Representative Chuck Strohm for their support of our financial assistance programs,” said Julie Cunningham, Executive Director of the OWRB. The Calumet Public Works Authority (Authority) received approval for a $102,500 loan Tuesday from the Oklahoma Water Resources Board (OWRB) to improve the Authority's wastewater infrastructure. The study and planning of upgrades and improvements to the wastewater system will be financed by a 100-percent principal forgiveness loan through the Oklahoma Clean Water State Revolving Fund (CWSRF). The Authority will use the funds for engineering studies on planning, mapping, and evaluation of sanitary sewer collection system improvements. Improvements will include manhole rehabilitation/replacement and sanitary sewer collection line replacement. The replacements will reduce the amount of inflow and infiltration which will in turn reduce unintended flows to the wastewater system. Joe Freeman, Chief of the OWRB's Financial Assistance Division, calculated that the Authority's customers will save an estimated $120,000 compared to traditional financing. The CWSRF loan will be secured with a lien on the revenues of the Authority's water, sewer, and sanitation systems, as well as a three cent sales tax. The Authority's officials attending the OWRB's monthly meeting in support of the loan application included Mayor Lacey Rowell and Consulting Engineer Michael Taylor, P.E. “We are grateful to State Senator Lonnie Paxton and State Representative Harold Wright for their support of our financial assistance programs,” said Julie Cunningham, Executive Director of the OWRB. The Inola Public Works Authority (Authority) received approval for a $161,250 loan Tuesday from the Oklahoma Water Resources Board (OWRB) to improve the Authority's wastewater infrastructure. The study and design of upgrades and improvements to the wastewater system will be financed by a 100-percent principal forgiveness loan through the Oklahoma Clean Water State Revolving Fund (CWSRF). The Authority will use the funds to perform a system wide inflow and infiltration investigation to prevent unpermitted discharges, prepare an enigineering report, and prioritize the replacement of lines. The investigation and report will address deficiencies with the existing collection system. Joe Freeman, Chief of the OWRB's Financial Assistance Division, calculated that the Authority's customers will save an estimated $190,000 over the life of the 10-year principal forgiveness loan compared to traditional financing. The CWSRF loan will be secured with a lien on the revenues of the Authority's water, sewer, and sanitation systems, as well as a one cent sales tax. The Authority's officials attending the OWRB's monthly meeting in support of the loan application included Board Member/Trustee Billy Wilson and Town Engineer Brian Kellogg, P.E. “We are grateful to State Senator Wayne Shaw and State Representative Tom Gann for their support of our financial assistance programs,” said Julie Cunningham, Executive Director of the OWRB. The Oklahoma Water Resources Board (OWRB) has announced the Water for 2060 Excellence Award program. The statewide award program was developed to recognize individuals and entities annually that have developed outstanding water saving measures in three categories— Public Water Supply, Energy/Industry, and Crop Irrigation/Agriculture Production. "These efforts are directly aligned with Governor Fallin's and our Legislature's groundbreaking goal of using no more fresh water resources in 2060 than we used in 2010 while maintaining our economic growth. It is important to take a moment to recognize outstanding examples of water conservation and efficiency to encourage similar projects in the future ," said OWRB Executive Director Julie Cunningham. Award winners in each category will be acknowledged at an upcoming luncheon at the 38th Annual Oklahoma Governor's Water Conference & Symposium on October 31st. Projects implemented within the last five years are eligible. Any individual, group, agency, association, council or organization may nominate an entity or may self-nominate. Nomination forms are available online at www.owrb.ok.gov/2060/award.php. Address questions to Lindy Clay at (405) 530-8858 or by email at lindy.clay@owrb.ok.gov. More information on the Governor's Water Conference & Symposium is available online at www.owrb.ok.gov/gwc. The Delaware Public Works Authority (Authority) in Nowata County received approval for a $74,600 Rural Economic Action Plan (REAP) Grant Tuesday through the Oklahoma Water Resources Board (OWRB) to improve the Authority's wastewater infrastructure. The Authority serves 221 customers with water and wastewater service. The proposed project consists of replacing two sections of lines experiencing inflow and infiltration with approximately 600 linear feet of 12-inch PVC sewer line. The estimated total project cost is $74,600, which is the OWRB REAP Grant amount requested. Joe Freeman, Chief of the OWRB's Financial Assistance Division, calculated that the grant will save the Authority's customers $134,280 in principal and interest charges by not having to borrow the project funds. Since 1983, the Water Resources Board has approved over $3.7 billion in loans and grants for water and wastewater infrastructure improvements throughout Oklahoma. 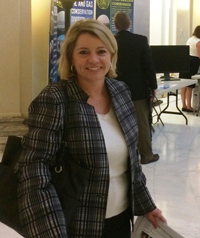 “We are grateful to State Senator Julie Daniels and State Representative Travis Dunlap for their continued support of water and wastewater infrastructure funding in Oklahoma,” said Julie Cunningham, OWRB Executive Director. The Pawnee County Rural Water District No. 5 (District) received approval for a $100,000 Emergency Grant Tuesday through the Oklahoma Water Resources Board (OWRB) to improve the District's water infrastructure. The District receives drinking water from the nearby Town of Ralston. The District owns and operates the water distribution system that serves approximately 83 meters. The existing main water line that connects the District and Ralston has developed blockage and collapsed due to the buildup of iron and manganese. To eliminate this problem, the District is proposing to temporarily replace the existing line by constructing approximately 2,600 linear feet of 4" water line, as well as fund engineering services to determine the feasibility of connecting to Pawnee County Rural Water District No. 3 as a permanent solution. The estimated total project cost is $130,000 of which $100,000 is the requested OWRB Emergency Grant, a $10,000 Oklahoma Emergency Management Grant, and a 15.4% match of $20,000 will be in-kind labor for the project as listed in the cost estimate. Attending the OWRB's monthly meeting in support of the grant application was District Board Member Johnny Wagner. Joe Freeman, Chief of the OWRB's Financial Assistance Division, calculated that the grant will save the District's customers $180,000 in principal and interest charges by not having to borrow the project funds. Since 1983 the Water Resources Board has approved over $3.7 billion in loans and grants for water and wastewater infrastructure improvements throughout Oklahoma. “We are grateful to Senator AJ Griffin and State Representative Dennis Casey for their continued support of water and wastewater infrastructure funding in Oklahoma,” said Julie Cunningham, OWRB Executive Director. The Stillwater Utilities Authority (Authority) received approval for $12,600,000 in funding Tuesday from the Oklahoma Water Resources Board (OWRB) to improve the Authority's water infrastructure. Construction of upgrades and improvements to the water system will be financed by the Oklahoma Drinking Water State Revolving Fund (DWSRF). The Authority will use the proceeds for four waterline projects at 32nd Avenue from Western Road to Sangre Road, Western Road from 6th Avenue to 19th Avenue, Western Road from 19th Avenue to 32nd Avenue, and Western Road from 32nd Avenue to 44th Avenue. The funds will also be used to construct a booster pump station at 32nd Avenue and Western Road and to demolish decommissioned facilities. The installation and replacement of the waterlines will improve water service, improve pressure, and reduce water loss in the distribution system. Joe Freeman, Chief of the OWRB's Financial Assistance Division, calculated that the Authority's customers will save an estimated $510,000 over the life of the 30-year loan compared to traditional financing. The DWSRF loan will be secured with a lien on the revenues of the Authority's water, sewer, and electric systems, as well as a one cent sales tax. Local officials attending the OWRB's monthly meeting in support of the loan application included Water Resources Director Bill Millis. Julie Cunningham, Executive Director of the OWRB, and Scott Thompson, Executive Director of the ODEQ, express their sincere appreciation to State Senator Tom Dugger and State Representative Cory Williams for their support of the DWSRF program. The Osage County Rural Water, Sewer, & Solid Waste Management District No. 3 (District) received approval for a $44,200 Rural Economic Action Plan (REAP) Grant Tuesday through the Oklahoma Water Resources Board (OWRB) to improve the District's water infrastructure. The District owns and operates a distribution system consisting of two standpipes, two booster pump stations, and water mains that serve approximately 270 customers. Due to their age, the existing water storage tanks are in need of rehabilitation. The District is proposing to rehabilitate the southernmost standpipe in the system, which is 8 feet in diameter and 112 feet tall, by sand blasting the tank surface and repainting it, and installing a 4-inch gate valve and box. The estimated total cost of the project is $44,200, which is the amount of the requested OWRB REAP Grant. Joe Freeman, Chief of the OWRB's Financial Assistance Division, calculated that the grant will save the District's customers $79,560 in principal and interest charges by not having to borrow the project funds. Since 1983 the Water Resources Board has approved over $3.7 billion in loans and grants for water and wastewater infrastructure improvements throughout Oklahoma. “We are grateful to State Senator Eddie Fields and State Representative Steven Vaughan for their continued support of water and wastewater infrastructure funding in Oklahoma,” said Julie Cunningham, OWRB Executive Director. The McCurtain Municipal Authority (Authority) in Haskell County received approval for a $71,323 Emergency Grant Tuesday through the Oklahoma Water Resources Board (OWRB) to improve the Authority's water infrastructure. The Authority purchases water from Poteau Valley Improvement Authority (PVIA) through a master meter. The proposed project consists of the installation of an aeration pump at the tower and automatic flushing hydrants. The projected cost of the project is $83,910, which will be funded by the OWRB Emergency Grant along with a 15% match of $12,586 in local funds. Attending the OWRB's monthly meeting in support of the grant application was Mayor Patrik Lovell. Joe Freeman, Chief of the OWRB's Financial Assistance Division, calculated that the grant will save the Authority's customers $128,382 in principal and interest charges by not having to borrow the project funds. Since 1983 the Water Resources Board has approved over $3.7 billion in loans and grants for water and wastewater infrastructure improvements throughout Oklahoma. “We are grateful to State Senator Larry Boggs and State Representative Ed Cannaday for their continued support of water and wastewater infrastructure funding in Oklahoma,” said Julie Cunningham, OWRB Executive Director. Wagoner County Rural Water, Sewer, Gas, & Solid Waste Management District No. 4 (District) received approval for a $5,745,000 Financial Assistance Program (FAP) loan Tuesday from the Oklahoma Water Resources Board (OWRB) to improve the District's water infrastructure. The District will use the FAP proceeds to install three 16-inch transmission waterlines, four 12-inch distribution waterlines, and three 6-inch distribution waterlines. The District is experiencing rapid growth and additional capacity is required. The new waterlines will support this development and replace undersized lines. According to Joe Freeman, Chief of the OWRB's Financial Assistance Division, the District's customers will save an estimated $611,000 over the life of the 15-year loan compared to traditional financing. The loan will be secured with a lien on the revenues of the District's water, sewer, and garbage systems. Local officials attending the OWRB's monthly meeting in support of the loan application included Business Manager Bill Giles and System Manager Rick Lang. “We are grateful to State Senator Kim David and State Representative Mike Ritze for their support of our financial assistance programs,” said Julie Cunningham, Executive Director of the OWRB. The Kendrick Municipal Authority (Authority) in Lincoln County received approval for a $93,500 Rural Economic Action Plan (REAP) Grant Tuesday through the Oklahoma Water Resources Board (OWRB) to improve the Authority's water infrastructure. The Authority serves approximately 172 customers. The proposed project consists of looping two different areas within the Authority's system with one mile of 3-inch water line, and the other with a mile of 4-inch water line to increase circulation. The proposed construction cost is $72,000 and the total project cost including related fees and contingencies is $93,500, which is the amount of the requested OWRB Reap Grant. Joe Freeman, Chief of the OWRB's Financial Assistance Division, calculated that the grant will save the Authority's customers $168,300 in principal and interest charges by not having to borrow the project funds. Since 1983, the Water Resources Board has approved over $3.7 billion in loans and grants for water and wastewater infrastructure improvements throughout Oklahoma. “We are grateful to State Senator Jason Smalley and State Representative Kevin Wallace for their continued support of water and wastewater infrastructure funding in Oklahoma,” said Julie Cunningham, OWRB Executive Director. The Cleveland County RWSG & SWMD No. 1 (District) received approval for a $150,000 Rural Economic Action Plan (REAP) grant Tuesday through the Oklahoma Water Resources Board (OWRB) to explore opportunities for adding a water supply source. Due to water quality issues with existing wells, the District has entered into a groundwater lease agreement with Oklahoma Department of Wildlife Conservation to take and use groundwater from 1,920 acres of land. The proposed project consists of drilling a test well, paying for water rights acquisition, and surveying. The estimated cost of the project is $150,000, which is the amount of the requested OWRB REAP grant. Joe Freeman, chief of the OWRB's Financial Assistance Division, calculated that the grant will save the District's customers $270,000 in principal and interest charges by not having to borrow the project funds. Since 1983 the Water Resources Board has approved over $3.6 billion in loans and grants for water and wastewater infrastructure improvements throughout Oklahoma. “We are grateful to State Senator John Sparks and State Representative Bobby Cleveland for their continued support of water and wastewater infrastructure funding in Oklahoma,” said Julie Cunningham, OWRB Executive Director. The Comanche Utilities Authority (Authority) in Stephens County received approval for a $150,000 Rural Economic Action Plan (REAP) grant Tuesday through the Oklahoma Water Resources Board (OWRB) to improve the Authority's water infrastructure. The proposed project consists of constructing a new 6-inch water line to create a dynamic loop that connects to an existing 6-inch water line, and all other related construction as needed. The projected cost is $168,367 of which $150,000 is funded by OWRB REAP grant along with $18,367 in local funds. Joe Freeman, chief of the OWRB's Financial Assistance Division, calculated that the grant will save the Authority's customers $270,000 in principal and interest charges by not having to borrow the project funds. Since 1983 the Water Resources Board has approved over $3.6 billion in loans and grants for water and wastewater infrastructure improvements throughout Oklahoma. “We are grateful to State Senator Paul Scott and State Representative Marcus McEntire for their continued support of water and wastewater infrastructure funding in Oklahoma,” said Julie Cunningham, OWRB Executive Director. The Harper County Rural Water District No. 1 (District) received approval for a $110,000 Rural Economic Action Plan (REAP) grant Tuesday through the Oklahoma Water Resources Board (OWRB) to improve the District's water infrastructure. The District has four operating water wells and one emergency water well that supply water to both residential and pasture taps. The proposed project consists of replacing all 365 meters with automatic radio read metering systems. The other equipment included are a laptop, system software, and transmitters. The projected cost of the project is $177,185, of which $110,000 is funded by the OWRB REAP Grant, along with $25,000 from Oklahoma Economic Development Authority and $42,185 in local funds. Joe Freeman, chief of the OWRB's Financial Assistance Division, calculated that the grant will save the Authority's customers $198,000 in principal and interest charges by not having to borrow the project funds. Since 1983 the Water Resources Board has approved over $3.6 billion in loans and grants for water and wastewater infrastructure improvements throughout Oklahoma. “We are grateful to State Senator Bryce Marlatt and State Representative Casey Murdock for their continued support of water and wastewater infrastructure funding in Oklahoma,” said Julie Cunningham, OWRB Executive Director. The Tulsa Metropolitan Utility Authority (Authority) received approval for a $21,725,000 loan Tuesday from the Oklahoma Water Resources Board (OWRB) to improve the Authority's wastewater infrastructure. Construction of upgrades and improvements to the wastewater system will be financed by the Oklahoma Clean Water State Revolving Fund (CWSRF). The Authority will utilize the proceeds to replace manual screens at the Northside Interceptor Lift station with 1/4 inch mechanical screens; replace large spaced bar screens at the Southside Influent Lift Station with mechanical fine screens; build a new 36-inch force main between the lift station and headworks at Haikey Creek; replace the Rose Dew Lift Station; and perform area wide sewer rehabilitation. The Authority is incorporating conservation to help meet the state's Water for 2060 Act and improved treatment technologies to deliver better services to the public. The project is designed to provide a reduction of future stormwater flooding events for community residents and businesses through better water management during high volume storm events. The project will also provide a decrease in the amount of runoff, as well as a decrease in the potential for bacteria, nutrients, and sediment being conveyed to the Arkansas River. Joe Freeman, Chief of the OWRB's Financial Assistance Division, calculated that the Authority's customers will save an estimated $1,333,000 over the life of the 20-year loan compared to traditional financing. The CWSRF loan will be secured with a lien on the revenues of the Authority's wastewater system. Attending the OWRB's monthly meeting in support of the loan application were Bob Shelton, Senior Special Projects Engineer, and Chris Havenar, Treasury Analyst. Since 1983, the Oklahoma Water Resources Board has approved over $3.6 billion in loans and grants for water and wastewater infrastructure improvements throughout Oklahoma. “We are grateful to state legislators from the Tulsa metro area for their support of our financial assistance programs,” said Julie Cunningham, Executive Director of the OWRB. The Grand Lake Public Works Authority (Authority) received approval for a $1,825,182.60 loan Tuesday from the Oklahoma Water Resources Board (OWRB) to improve the Authority's wastewater infrastructure. Construction of upgrades and improvements to the wastewater system will be financed by the Oklahoma Clean Water State Revolving Fund (CWSRF). The Authority will utilize the proceeds to refinance an OWRB loan which funded sewer system improvements. Also, the Authority will repair the main lift station with a grinder pump on the influent line, construct a new lift station at the midway point on the existing 12 inch forcemain to provide for cleaning of the main forcemain and help with delivery to the plant, construct new lift stations at Diamond Point, construct a new collection system at Heritage Point, and add 20 lift stations to the existing supervisory control and data acquisition system for monitoring. The recommended improvements will help address waste build up in the forcemain lines, improve capabilities and reliability of the system to service its customers, and improve inflow and infiltration issues. Grand Lake Public Works Authority currently does not need to discharge to the Grand Lake O' the Cherokees. These improvements will help Grand Lake PWA continue to avoid the need to discharge into the surrounding lake thus protecting it from further degradation. Joe Freeman, Chief of the OWRB's Financial Assistance Division, calculated that the Authority's customers will save an estimated $213,000.00 on the new construction portion of the 20-year loan compared to traditional financing. The CWSRF loan will be secured with a lien on the revenues of the Authority's water and wastewater system. Attending the OWRB's monthly meeting in support of the loan application was Jim Anderson, Manager and Steve Garrett, Secretary. “We are grateful to State Senator Micheal Bergstrom and Representative Josh West for their support of our financial assistance programs,” said Julie Cunningham, Executive Director of the OWRB. The Oklahoma Water Resources Board (OWRB) water monitoring staff announced the release of the agency's 2016 Beneficial Use Monitoring Program (BUMP) reports providing detailed physical, chemical, and biological water data from approximately 1,300 stream, lake, and groundwater well sites across Oklahoma. Created in 1998, BUMP provides data necessary for water quality management decisions by identifying impairments to the "beneficial uses" of Oklahoma's water resources, as well as determining causes for those water quality impairments. Oklahoma's "beneficial uses" form the backbone of the state's Water Quality Standards, and are assigned to individual lakes, streams, and stream segments based upon the primary public benefits derived from those waters. Currently recognized beneficial uses of Oklahoma water include public and private water supply, fish and wildlife propagation, agriculture, primary body contact recreation (such as swimming), secondary body contact recreation (such as boating or fishing), navigation, and aesthetics. "The program is the cornerstone of the state's water monitoring and resource management," said OWRB Executive Director Julie Cunningham. "It exists as a result of the vital economic and social importance of Oklahoma's lakes, streams, wetlands, and aquifers as well as the associated need for their protection and management." The water data contained in the OWRB's annual BUMP report is collected from about 130 lakes and 100 stream segments at approximately 600 sites throughout Oklahoma. The Groundwater Monitoring and Assessment Program (GMAP), added to BUMP in 2012, consists of a network of approximately 750 wells in Oklahoma's 21 major aquifers, where the OWRB monitors both water levels and water quality. "Oklahomans can be proud of the scientific expertise, professionalism, and dedication of the OWRB's water quality standards staff and water monitoring teams. The BUMP monitors are out sampling during all sorts of conditions, year-round, to make sure Oklahoma's water planners have comprehensive water quality data," said Bill Cauthron, chief of the OWRB's Water Quality division. For lake sampling, generally a minimum of three to five stations per lake are sampled depending on the size of the reservoir. Sampling stations are located to represent multiple zones of the lake with additional sites on many reservoirs as necessary. The stream monitoring network consists of permanent sampling stations in each of the state's 82 water planning basins, as outlined by the Oklahoma Comprehensive Water Plan, and a smaller network of additional reference sites. Assessing Oklahoma's groundwater is achieved through both a baseline monitoring network and a long-term (trend) monitoring network within each of the state's 21 major aquifers. This provides information on individual aquifer characteristics as well as a more general assessment of the Oklahoma's groundwater. The 2016 lakes, streams, and groundwater BUMP reports are available on the OWRB website. Each stream, lake, and well site featured in the report include a detailed fact sheet and map of data collection sites. For additional information, visit the OWRB's Monitoring & Assessment page. Choctaw County Rural Water & Sewer District No. 1 (District) received approval for a $2,015,000 Financial Assistance Program (FAP) loan Tuesday from the Oklahoma Water Resources Board (OWRB) to refinance debt originally issued to improve the District's water and wastewater systems and finance further improvements to the water system. The District will utilize the FAP proceeds to refinance its 2007 and 2013 Capital Improvement Revenue Bonds. The 2007 Bonds were used to finance the construction of a water well, a well house, a standpipe, sewer lines, a lift station, and expansion of the sewer lagoon. The 2013 Bonds were used to finance the construction of waterlines, installation of automated meter readers, a storage tank, and repainting of a standpipe. The FAP proceeds will also be used to install new waterlines. According to Joe Freeman, chief of the OWRB's Financial Assistance Division, the District's customers will save an estimated $713,000 over the life of the 18-year loan compared to traditional financing. The loan will be secured with a lien on the revenues of the District's water and wastewater revenues. Attending the OWRB's monthly meeting in support of the loan application was Rick Smith, the District's Financial Advisor. “We are grateful to State Senator Joseph Silk and State Representative Justin Humphrey for their support of our financial assistance programs,” said Julie Cunningham, Executive Director of the OWRB. The Copan Public Works Authority (Authority) in Washington County received approval for a $99,500 Rural Economic Action Plan (REAP) grant Tuesday through the Oklahoma Water Resources Board (OWRB) to improve the Authority's wastewater infrastructure. The wastewater treatment and collection system of the Authority consists of discharging treatment lagoons, treatment tanks, land application, manholes, and lift stations. The manholes have deteriorated over the years and caused water to infiltrate the collection system. The project consists of replacing the failing manholes, evaluating sections of the PVC sewer pipe, and all other related construction and appurtenances. The projected cost of the project is $100,800 which is funded by the OWRB REAP grant along with $1,300 in local funds. Joe Freeman, chief of the OWRB's Financial Assistance Division, calculated that the grant will save the Authority's customers $179,000 in principal and interest charges by not having to borrow the project funds. Since 1983 the Water Resources Board has approved over $3.6 billion in loans and grants for water and wastewater infrastructure improvements throughout Oklahoma. Hughes County Rural Water District No. 5 (District) received approval for an $885,000 Financial Assistance Program (FAP) loan Tuesday from the Oklahoma Water Resources Board (OWRB) to refinance debt originally issued to improve the District's water system and finance further improvements to the system. The District will utilize the FAP proceeds to refinance an already existing OWRB FAP loan which was used to finance waterlines, gate valves, a master meter, and a pump station with a storage tank to loop and extend service to homes that were not on a public water source. Also, additional construction will include installing a waterline and adding a larger well, a pump, and a blow out valve to their current system. According to Joe Freeman, chief of the OWRB's Financial Assistance Division, the District's customers will save an estimated $166,000 over the life of the approximately 30-year loan, compared to traditional financing. The loan will be secured with a lien on the revenues of the District's water system. Attending the OWRB's monthly meeting in support of the loan application was Clyde Collis, District Board Member. "We are grateful to State Senator Greg McCortney and State Representative Steve Kouplen for their support of our financial assistance programs,” said Julie Cunningham, Executive Director of the OWRB. Idabel Public Works Authority (Authority) received approval for a $4,325,000 Financial Assistance Program (FAP) loan Tuesday from the Oklahoma Water Resources Board (OWRB) to improve their water system. The Authority obtains its water from Little River and stores it in three storage tanks. The poor condition of these tanks considerably reduces the above ground water capacity of the system. The situation requires additional above-ground storage capacity. The Authority will utilize the FAP proceeds to install two 500,000 gallon elevated storage tanks. According to Joe Freeman, chief of the OWRB's Financial Assistance Division, the Authority's customers will save an estimated $1,207,000 over the life of the approximately 30-year loan compared to traditional financing. The loan will be secured with a lien on the revenues of the Authority's water, wastewater, and solid waste systems, as well as a one cent sales tax. Attending the OWRB's monthly meeting in support of the loan application was Tina Foshee-Thomas, Mayor. “We are grateful to State Senator Joseph Silk and State Representative Johnny Tadlock for their support of our financial assistance programs,” said Julie Cunningham, Executive Director of the OWRB. Muskogee County Rural Water District No. 3 (District) received approval for a $1,890,000 Financial Assistance Program (FAP) loan Tuesday from the Oklahoma Water Resources Board (OWRB) to refinance debt originally issued to improve the District's water system and finance further improvements to the system. The District will utilize the FAP proceeds to refinance its Series 2008 Bonds, which were issued to pay off USDA notes and finance rehabilitation of its water treatment plant. Also, the funds will be used to install a clarifier cover and to install a pump and a waterline to connect to an existing tower to improve water pressure in the District. According to Joe Freeman, chief of the OWRB's Financial Assistance Division, the District's customers will save an estimated $950,000 over the life of the 17 1/2-year loan compared to traditional financing. The loan shall be secured with a lien on the revenues of the District's water system. Attending the OWRB's monthly meeting in support of the loan application was John Dock, Chairman. “We are grateful to State Senator Kim David and Representative Scott Fetgatter for their support of our financial assistance programs,” said Julie Cunningham, Executive Director of the OWRB. Oklahoma's Water for 2060 Produced Water Working Group (PWWG) today released its study report as part of a review of alternatives for produced water disposal from oil and gas operations in Oklahoma. In December 2015, Governor Mary Fallin charged a 17-member fact-finding group led by the Oklahoma Water Resources Board (OWRB), to study and recommend ways that water produced in oil and natural gas operations may be recycled or reused as part of Oklahoma's ongoing efforts to promote water supply reliability and drought resiliency across multiple water user sectors. "I thank the working group for completing this initial review of the opportunities and challenges associated with reducing produced water injection as well as reducing the use of fresh water in oil and gas production," said Fallin. "I know many of the oil and gas producers in Oklahoma continue to work diligently on the issue of water reuse and recycling innovation, and they remain committed to responsible development of our state's resources. At the same time, our agencies are working diligently on responsible and cost-effective ways to harness Oklahoma's marginal quality waters for use as a way to better manage Oklahoma's fresh water supplies. That's why I believe it was critically important to conduct this study with input from a wide spectrum of industry sectors and regulatory agencies as it brings together these two very important efforts." In support of the working group's efforts, a technical study team conducted a preliminary investigation of the feasibility and cost effectiveness of several scenarios. The report identified several options that warrant further study, including treatment and reuse of produced water by local oil and gas operations, transfer to areas of high demand, and use of evaporation technologies. The report may be viewed here. "This report is an important first step into the investigation of produced water use," said Oklahoma Secretary of Energy and Environment Michael Teague. "It will serve as an important guide as we continue further detailed research of these alternatives that will undoubtedly be the next critical steps in this on-going effort." This work is a continuation of the implementation of the 2012 Oklahoma Comprehensive Water Plan (OCWP). In one of several actions to implement the plan's priority recommendations, the passage of the Water for 2060 Act in 2012 established Oklahoma as the first state to set a 50-year goal of holding fresh water consumption fixed while preserving future economic and population growth. The act calls for the use of voluntary conservation, water infrastructure improvements and development of marginal water supplies, like produced water, that are currently underutilized. Members of the workgroup were selected to represent Oklahoma's oil and gas industry along with a wide array of potential water users and stakeholders, including industry, power generation, agriculture, public water providers, state regulators, environmental organizations, and research organizations and universities. The Town of Corn has received approval for a $99,590 Rural Economic Action Plan (REAP) grant Tuesday through the Oklahoma Water Resources Board (OWRB) to improve the community's wastewater infrastructure. The community owns and operates a wastewater treatment and collection system. The system has infiltration and inflow problems resulting in a large amount of inflow into the sewer lagoons. The proposed project consists of replacing sewer lines with new 8-inch pipe, installing new manholes and service connections, conducting a video inspection of lines, and all other related construction as necessary. The projected cost of the project is $99,590. Joe Freeman, chief of the OWRB's Financial Assistance Division, calculated that the grant will save the Town's customers $179,000 in principal and interest charges by not having to borrow the project funds. Since 1983 the Water Resources Board has approved over $3.6 billion in loans and grants for water and wastewater infrastructure improvements throughout Oklahoma. “We are grateful to State Senator Mike Schulz and State Representative Todd Russ for their continued support of water and wastewater infrastructure funding in Oklahoma,” said Julie Cunningham, OWRB Executive Director. The Stonewall Public Works Authority (Authority) in Pontotoc County received approval for a $99,999 Rural Economic Action Plan (REAP) grant Tuesday through the Oklahoma Water Resources Board (OWRB) to improve the Authority's wastewater infrastructure. The Authority owns and operates the wastewater lagoon system. Excess rainfall has filled the ponds creating a wave action that has eroded the center dike between the two primary treatment cells. The proposed project consists of dike rehabilitation with installation of rip rap armor and other related construction as needed. The projected cost of the project is $99,999. Joe Freeman, chief of the OWRB's Financial Assistance Division, calculated that the grant will save the Authority's customers $180,000 in principal and interest charges by not having to borrow the project funds. Since 1983 the Water Resources Board has approved over $3.6 billion in loans and grants for water and wastewater infrastructure improvements throughout Oklahoma. “We are grateful to State Senator Greg McCortney and State Representative Todd Thomsen for their continued support of water and wastewater infrastructure funding in Oklahoma,” said Julie Cunningham, OWRB Executive Director. The South Delaware County Regional Water Authority (Authority) received approval for $3,000,000 in funding Tuesday from the Oklahoma Water Resources Board (OWRB) to purchase and expand on an existing water system for the purpose of creating a regional water service for the area. Construction of upgrades and improvements to the water system will be financed by the Oklahoma Drinking Water State Revolving Fund (DWSRF) along with $10,635,000 in Rural Utilities Services funds, $1,629,000 in Indian Health Services funds, $347,400 in Cherokee Nation funds, and $90,000 in local funds. The Authority will utilize the proceeds to acquire and construct a water treatment plant and distribution system to serve existing customers of Flint Ridge Rural Water District and wholesale water to West Siloam Springs, Kansas, and Delaware County Rural Water District (RWD) #11. Delaware Co. RWD #11 will in turn sell water to Colcord. The loan proceeds will also be used to expand the raw water intake capacity, construct and purchase raw and potable waterlines, as well as construct two storage tanks, three pump stations, and a master meter. This project will bring a more sustainable water supply for all entities that will purchase water from South Delaware County Regional Water Authority. The project will help meet the State of Oklahoma's Water for 2060 goals by reducing the number of wells being used for public water supplies. Joe Freeman, Chief of the OWRB's Financial Assistance Division, calculated that the Authority's customers will save an estimated $3,897,000 over the life of the 30-year loan compared to traditional financing. The DWSRF loan will be secured with a lien on the revenues of the Authority's water system. South Delaware County Regional Water Authority's officials attending the OWRB's monthly meeting in support of the loan application included Don Wilcoxen, Chairman; Keith Morgan, Trustee; P.A. Engle, Accountant; Terry Woods, System Operator; and Jay Updike, Consulting Engineer. Julie Cunningham, Executive Director of the OWRB, and Scott Thompson, Executive Director of the ODEQ, express their sincere appreciation to State Senators Micheal Bergstrom and Wayne Shaw and State Representatives William Fourkiller and Josh West for their support of the DWSRF program. The Muskogee Municipal Authority (Authority) received approval for a $27,360,000 loan Tuesday from the Oklahoma Water Resources Board (OWRB) to improve the Authority's wastewater/stormwater infrastructure. Construction of upgrades and improvements to the wastewater/stormwater system will be financed by the Oklahoma Clean Water State Revolving Fund (CWSRF). The Authority will utilize the proceeds to repair several wastewater lift stations, upgrade sewer collection lines on certain basins, improve the wastewater treatment plant, address stormwater drainage issues in the Civitan Basin, and acquire key equipment. The recommended improvements will help address an Oklahoma Department of Environmental Quality (ODEQ) Consent Order, improve capabilities and reliability of the system to treat the wastewater at the plant, and help reduce future stormwater flooding events for community residents and businesses. These improvements would allow the City to better manage high volume storm events, and decrease the amount of runoff and erosion thus helping to decrease the potential amount of bacteria, nutrients, and sediment being conveyed to the Arkansas River. Joe Freeman, Chief of the OWRB's Financial Assistance Division, calculated that the Authority's customers will save an estimated $3,392,000 over the life of the 30-year loan, compared to traditional financing. The CWSRF loan will be secured with a lien on the revenues of the Authority's water and sewer systems. Muskogee Municipal Authority's official attending the OWRB's monthly meeting in support of the loan application was Mike Stewart, Assistant City Manager and Greg Riley, Public Works Director. “We are grateful to State Senator Dewayne Pemberton, and State Representatives George Faught and Avery Frix, for their support of our financial assistance programs,” said Julie Cunningham, Executive Director of the OWRB. The Kiowa Public Works Authority (Authority) in Pittsburg County received approval for a $99,999 Rural Economic Action Plan (REAP) grant Tuesday through the Oklahoma Water Resources Board (OWRB) to improve the Authority's water infrastructure. The Authority owns and operates the water treatment plant and distribution system. The water system has issues related to disinfection byproducts. The proposed project consists of installation of recirculation pumps with aeration nozzles on the clearwell and the water tower, replacement of the piping at the water tower, repainting the water tower, and other related construction as needed. The projected cost of the project is $99,999. “We are grateful to Senator Larry Boggs and Representative Donnie Condit for their continued support of water and wastewater infrastructure funding in Oklahoma,” said Julie Cunningham, OWRB Executive Director. The Oklahoma Water Resources Board voted unanimously Tuesday to name Julie Cunningham as the agency's next executive director. Cunningham had been serving as the interim executive director since October 2016 following the departure of J.D. Strong to lead the Oklahoma Department of Wildlife Conservation. Cunningham attends Oklahoma Water Appreciation Day at the Oklahoma State Capitol after being named OWRB Executive Director. Cunningham has significant leadership experience in each of the agency's three operational divisions. Cunningham first joined the board as a member of the Water Quality Division where she sampled lake across the state monitoring program before supervising the Water Quality Standards section. She transitioned to the Financial Assistance Division serving both as Assistant Division Chief, and program manager for the agency's Clean Water State Revolving Fund. Prior to being named interim executive director, Cunningham served as chief of the board's Planning and Management Division. While in that role, Cunningham oversaw the implementation of the Oklahoma Comprehensive Water Plan, water rights administration, technical hydrologic studies, and hazard mitigation programs. Ms. Cunningham continues to hold leadership positions with the Interstate Council on Water Policy, Association of Western States Engineers, and four interstate river commissions. "We are fortunate to have a person so well-versed in each phase of the OWRB's operations," said OWRB Chairman Linda Lambert. "On behalf of my fellow board members, I congratulate Julie and her staff for continuing the OWRB's strong legacy of public service throughout this recent transition. I look forward to working with her to continue the important work of managing, protecting, and enhancing Oklahoma's water resources." The Oklahoma Conservation Commission (OCC) received approval for a $300,000 loan Tuesday from the Oklahoma Water Resources Board (OWRB) to implement four nonpoint source management projects that will help improve water quality. Construction of the nonpoint source projects will be financed by the Oklahoma Clean Water State Revolving Fund (CWSRF) along with $125,000 of cost-share that will be provided as in-kind services from OCC and in-kind services and cash funds from other groups. The OCC will utilize a portion of the proceeds to construct a pervious pavement parking lot at Lake McMurtry. The project will be constructed in conjuntion with the City of Stillwater and Friends of Lake McMurtry, a local not for profit organization. OCC in conjunction with the Grand River Dam Authority (GRDA) will construct a bioretention cell at GRDA's Ecosystem and Education Center in Langley to capture and treat stormwater from the Center. The final project will be to enlarge and construct a wetland at Lake Eufaula. OCC will partner with the City of Eufaula and Team Up To Clean Up, a local Eufaula Non-profit Organization to implement the project. Joe Freeman, Chief of the OWRB's Financial Assistance Division, calculated that OCC and the projects partners will save an estimated $337,000, if compared to using traditional financing to implement the projects. The CWSRF loan will be 100% principally forgiven. OCC officials attending the OWRB's monthly meeting in support of the loan application included Shanon Phillips, Water Quality Director and Jeri Fleming, Environmental Programs Manager. “We are grateful to the number of State Senators and Representative that support of our financial assistance programs,” said Julie Cunningham, Executive Director of the OWRB. The Hanna Public Works Authority (Authority) in McIntosh County received approval for a $99,999 Rural Economic Action Plan (REAP) grant Tuesday through the Oklahoma Water Resources Board (OWRB) to improve the Authority's wastewater infrastructure. The Authority owns and operates two water wells and the distribution system that serves the community. The water system is in need of multiple repairs with priority given to the most critical parts. The proposed project consists of replacing the water pump controls, water pumps, and control panels on the lift stations. The projected cost of the project is $99,999 which is the amount of the requested OWRB REAP grant. Joe Freeman, Chief of the OWRB's Financial Assistance Division calculated that the grant will save the Authority's customers $179,820 in principal and interest charges by not having to borrow the project funds. Since 1983 the OWRB has approved over $3.6 billion in loans and grants for water and wastewater infrastructure improvements throughout Oklahoma. “We are grateful to Senator Roger Thompson and Representative Donnie Condit for their continued support of water and wastewater infrastructure funding in Oklahoma,” said Julie Cunningham, OWRB Executive Director. The Jet Utilities Authority (Authority) in Alfalfa County received approval for a $39,900 Rural Economic Action Plan (REAP) grant Tuesday through the Oklahoma Water Resources Board (OWRB) to improve the Authority's water infrastructure. Jet Utilities Authority owns and operates two water wells and the distribution system that serves the community. One of the wells has reduced in production due to heavy clogging of the screen. The proposed project consists of drilling an offset well, constructing a new well house, and connecting the electrical system. The projected cost of the project is $49,900 which will be funded by OWRB REAP grant along with $10,000 in local funds. Joe Freeman, chief of the OWRB's Financial Assistance Division, calculated that the grant will save the Authority's customers $71,820 in principal and interest charges, by not having to borrow the project funds. Since 1983 the Water Resources Board has approved over $3.6 billion in loans and grants for water and wastewater infrastructure improvements throughout Oklahoma. “We are grateful to Senator A.J. Griffin and Representative Carl Newton for their continued support of water and wastewater infrastructure funding in Oklahoma,” said Julie Cunningham, OWRB Executive Director. The Norman Utilities Authority (Authority) received approval for a $304,625 loan Tuesday from the Oklahoma Water Resources Board (OWRB) for improvements along Brookhaven Creek. The improvements will be financed by the Oklahoma Clean Water State Revolving Fund (CWSRF) along with U.S. Department of Transportation funds and local funds. The Authority will utilize the proceeds to fund a portion of a green infrastructure improvements project. The project will consist of planting trees and shrubs, installation of diversion logs, pervious pavement, acquisition of drainage easement and reinforced vegetation systems to reduce erosion in the system and stabilize Brookhaven Creek stream bank. The project will help to reduce erosion, increase the capacity of the creek, and reduce flooding in the area. Joe Freeman, Chief of the OWRB's Financial Assistance Division, calculated that the Authority's customers will save an estimated $515,000 when compared to seeking traditional financing for the proposed improvements. The $304,625 loan will be 100% principally forgiven by the OWRB. Attending the OWRB's monthly meeting in support of the loan application included Carrie Evenson, City of Norman Stormwater Engineer and John Clink, City of Norman Capital Projects Manager. “We are grateful to State Senator Rob Standridge and Representative Josh Cockroft, for their support of our financial assistance programs,” said Julie Cunningham, Executive Director of the OWRB. The Wagoner County Rural Water District #5 (District) received approval for $3,965,000 in funding Tuesday from the Oklahoma Water Resources Board (OWRB) to improve the District's water infrastructure. Construction of upgrades and improvements to the water system will be financed by the Oklahoma Drinking Water State Revolving Fund (DWSRF). The District will utilize the proceeds to replace an existing 14-inch waterline with approximately 30,000 linear feet of 18-inch waterline, 9,000 linear feet of 16-inch waterline and install ten fire hydrants. Replacing the existing 14-inch line will help the District meet projected peak flow for the expected continued growth in the area. The project will help reduce water loss that has occurred in the past due to joint failures. Joe Freeman, Chief of the OWRB's Financial Assistance Division, calculated that the District's customers will save an estimated $994,000, over the life of the 30-year loan, compared to traditional financing. The DWSRF loan will be secured with a lien on the revenues of the District's water utilities. Wagoner County Rural Water District #5's officials attending the OWRB's monthly meeting in support of the loan application included: Arvil Morgan, District Manager; Denette Hughes, Office Manager; and Jason Snelson, District Distribution Manager. Julie Cunningham, Executive Director of the OWRB, and Scott Thompson, Executive Director of the ODEQ, express their sincere appreciation to State Senator Earl Garrison and Representative Kevin McDugle for their support of the DWSRF program. The Muskogee Municipal Authority (Authority) received approval Tuesday for a $110,000 loan from the Oklahoma Water Resources Board (OWRB) to conduct a stormwater basin study of the Civitan Drainage Basin. In addition to the OWRB's Clean Water State Revolving Fund (CWSRF) loan, the engineering study will be financed through $38,000 in local funding. The Civitan Basin has experienced flooding events in the past. Stormwater has covered roads and inundated homes in the drainage basin due to undersized stormwater infrastructure that is in need of rehabilitation. A hydraulics analysis of the basin and a physical inspection of the infrastructure will be conducted to evaluate alternatives, to develop cost estimates, and to prioritize improvements in the drainage basin to reduce the risk of future stormwater flooding. Muskogee's Assistant Public Works Director, George Kingston was in attendance at the OWRB's monthly meeting in support of the loan application. The CWSRF program is administered by the Oklahoma Water Resources Board with partial funding from the U.S. Environmental Protection Agency (EPA). The loan will be funded through the principal forgiveness portion of the 2016 EPA CWSRF Capitalization Grant. Oklahoma utilizes the CWSRF to provide communities the resources necessary to maintain and improve the infrastructure that protects our valuable water resources statewide. Since 1983, the Oklahoma Water Resources Board has approved over $3.5 billion in loans and grants for water and wastewater infrastructure improvements throughout Oklahoma. “We are grateful to State Senator Dewayne Pemberton and State Representatives George Faught and Avery Frix, for their support of our financial assistance programs,” said Julie Cunningham, interim Executive Director of the OWRB. The Norman Utilities Authority (Authority) received approval for $31,000,000 in funding Tuesday from the Oklahoma Water Resources Board (OWRB) to improve the community's water infrastructure. Construction of upgrades and improvements at the existing water treatment facility will be financed by the Oklahoma Drinking Water State Revolving Fund (DWSRF). The Authority will utilize the proceeds for improvements to its 17-million gallon per day Water Treatment Plant including the construction of a new intermediate pump station, a new ozone system, a new ultraviolet (UV) disinfection system, a new and modified chemical feed equipment with related facilities, a new maintenance building, and a new administration building. The project also includes the replacement of existing pumps at a high service pump station, modifications to the existing filtration building, and any associated electrical and control system improvements. The Authority's new UV system will provide for the Authority's water treatment needs while eliminating the use of chloramine which is currently utilized and is regulated for disinfection byproducts. Joe Freeman, chief of the OWRB's Financial Assistance Division, calculated that the Authority's customers will save an estimated $7,190,000 over the life of the 20-year loan by using the DWSRF program. The DWSRF loan will be secured with a lien on the revenues of the Authority's water and sewer system. Norman Utilities Authority's officials attending the OWRB's monthly meeting in support of the loan application included: Ken Komiske, Director of Utilities; Anthony Francisco, Finance Director and Chris Mattingly, Capital Projects Engineer. Julie Cunningham, interim Executive Director of the OWRB, and Scott Thompson, executive director of the ODEQ, express their sincere appreciation to state legislators from Norman. Delaware County Rural Water District No. 3 (District) received approval Tuesday for a $1,175,000 Financial Assistance Program (FAP) loan from the Oklahoma Water Resources Board (OWRB) to refinance debt originally issued to improve the District's water system. The District will utilize the FAP proceeds to refinance five existing U.S. Department of Agriculture Rural Development (USDA-RD) loans. The original USDA-RD loans were issued for the construction of improvements to the District's water treatment plant and distribution system. Through refinancing the existing loan with the FAP, the District will create a significant savings for its customers who essentially repay the loan through their regular water bill payments. Joe Freeman, chief of the OWRB's Financial Assistance Division, calculated that the grant will save the Authority's customers $170,100 in principal and interest charges, by not having to borrow the project funds. Since 1983 the Water Resources Board has approved over $3 billion in loans and grants for water and wastewater infrastructure improvements throughout Oklahoma. “We are grateful to State Senator Bryce Marlatt and State Representative Gus Blackwell for their continued support of water and wastewater infrastructure funding in Oklahoma,” said Julie Cunningham, interim Executive Director of the OWRB. The Choctaw Utilities Authority (Authority) received approval Tuesday for a $9,775,000 Clean Water State Revolving Fund (CWSRF) loan, and a $1,440,000 Financial Assistance Program (FAP) loan, from the Oklahoma Water Resources Board (OWRB) to improve the Authority's wastewater infrastructure. The Authority will use loan proceeds from the $9,775,000 CWSRF loan to upgrade the existing wastewater treatment facility and refinance a portion of an existing bank loan for the design of the wastewater treatment facility. The existing Sequencing Batch Reactor plant will be upgraded to an Alternating-Zone Extended-Air Activated Sludge process to treat the wastewater generated from portions of Choctaw and the surrounding area. The improvements will help address an Oklahoma Department of Environmental Quality (ODEQ) Consent Order, and will improve the water quality of the Authority's discharge to the receiving stream, the North Canadian River. The Authority will use the funds from the second loan, totaling $1,440,000, for design and construction of upgrades to their wastewater treatment plant and sludge handling facility. The funds will be used to refinance an interim bank loan that was originally used for the purchase of a rotary press and for wastewater treatment plant design. Joe Freeman, chief of the OWRB's Financial Assistance Division, calculated that the Authority's customers will save an estimated $1,819,000 over the life of the two loans. The CWSRF loan will be secured with a lien on the revenues of the Authority's water and sewer system and a two cent sales tax. Officials attending the OWRB's monthly meeting in support of the loan application included Bernie Nauheimer, Interim City Manager and Randy Jacox, Public Works Director. “We are grateful to State Senator Ron Sharp and Representative Lewis Moore, for their support of our financial assistance programs,” said Julie Cunningham, interim executive director of the OWRB.